A pioneering housing scheme in West Lothian could prevent youth homelessness if it was rolled out across Scotland, a charity has claimed. The Rock Trust has called on councils and housing providers to set up “housing first” schemes, which would give homeless young people a permanent home without the need to prove they are “housing ready” after being passed through different stages of temporary accommodation. There are currently ten housing first projects around the UK, including one in Glasgow that supports adults with addictions, but this scheme, in Livingston, is the first time the project has targeted young people. Under the Rock Trust’s youth project, five young people who were in care are now living in permanent, furnished homes with no conditions or time limits. The young people get a roof over their heads as well as intensive one-to-one support on a “whatever it takes” basis, across health, education and employment. Set up last year in partnership with Almond Housing Association, the two-year pilot is now expanding after a funding boost. The charity says the scheme could put save lives and put an end to the use of temporary accommodation which it warns is “unsafe and unsuitable” for young people. It comes as a new report from Heriot Watt University has found too many young people are still living in B&B and hostel accommodation while homeless, which can be “intimidating and harmful”. In 2016-17 a total of 1,755 temporary accommodation placements for young people were into hostels and 670 into B&Bs. Young people aged 16-24 are over-represented in the homeless population. 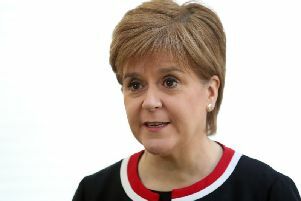 At least 21 per cent of young people become homeless within five years of leaving care, according to the latest statistics from the Scottish Government. But the figure could be as high as 30–50 per cent, due to unreported homelessness. The Rock Trust project was set up in West Lothian, as it saw the highest increase in temporary accommodation in Scotland. Councils have a legal duty to provide care leavers with extra help but research has underlined a lack of awareness of the rights and young people being let down or falling through the cracks when the move to adult services. After being awarded an additional £50,000 from Nationwide the project will support double the number of young people, helping another five youngsters into permanent homes. Earlier this year a Holyrood Committee recommended the use of housing first across Scotland.